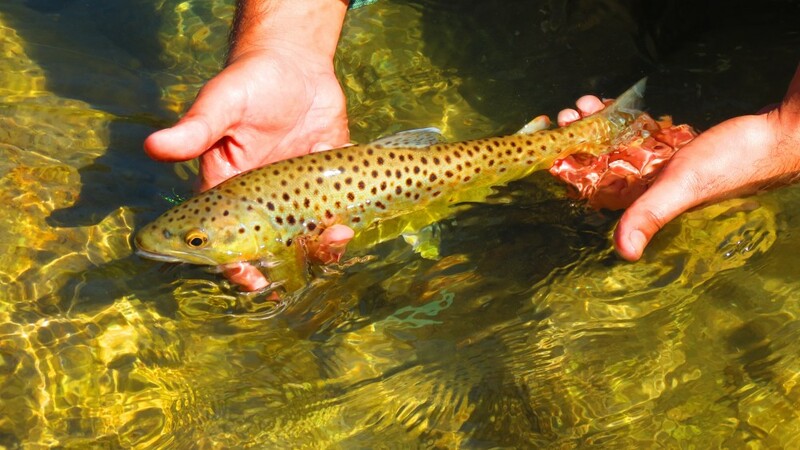 Most of the cold water streams and rivers in the Indian Himalayas have wild Brown Trout. The best Trout waters are tributaries (feeder streams) to the main rivers in quaint Valleys at an altitude of 4500 ft to 9000 ft. The river valleys offer great sightseeing, indigenous culture, birding and nature walks as other attractions. Our Trout waters have a higher gradient; the bottom is rocks, pebbles and lined with boulders creating ample structure and breaks for Trout to live and feed from. Faster water narrows the line of sight for Trout making it necessary to present the flies at an appropriate depth. Due to this reason, we’ve had the most success with swung wet flies and streamers. Indicator Nymphing with bead head Nymphs also works well. However, there are times when the fish are dialed in on a hatch, the best time to use Dry Flies. The best Fly rod to use for Trout fishing in the Himalayas is an 8 ft 4/5 wt. We use clear 8 lb test line as Tippet. Himalayan Brown Trout are aggressive and elusive at times on the same day. A well-presented offering is often rewarded with an inspection bite, it is extremely important to convert this bite into a hook set, otherwise, be ready to prepared to wait sometime to make the next cast or move on to the next pool. Our Brown Trout are not Trophy sized but give a good account of themselves when hooked on light tackle. Angling as a Sport, is still at a nascent stage in India so most likely you’ll have the entire stream or river to yourself. Himalayan Golden Mahseer is a cyprinid species widespread in Spring-fed rivers, Glacial rivers and Lakes in the Lower Himalayan range of the Indian Subcontinent. 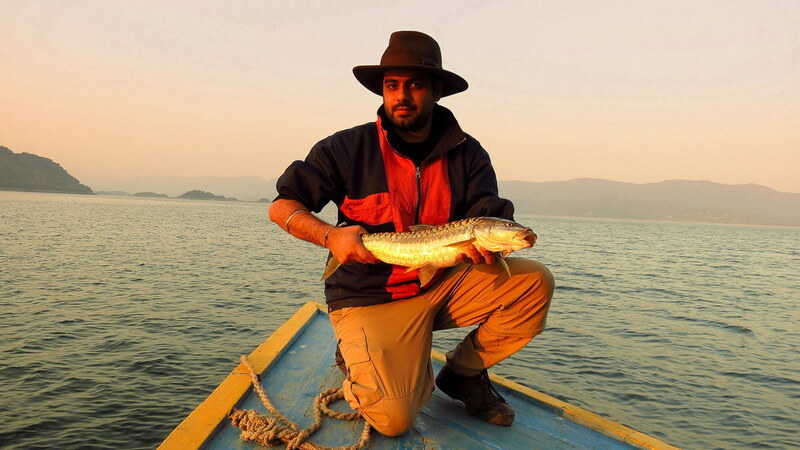 Golden Mahseer is the flagship Sport fish of the Indian Himalayas. Mahseer is an indigenous fish which has evolved over centuries to survive the turbulent Himalayan rivers, surviving and spawning in the monsoon months when the river washes everything in its path. Mahseer move upstream swimming against the river current in its highest flows. Mahseer is a vital indicator of the health of the fragile Himalayan river eco-system. Mahseer are omnivorous fish which readily take anything from algae, insects, frogs, crustaceans and other fish. Spring fed rivers run crystal clear for the most part of the year so you can spot a fish under water, which makes angling both challenging and gratifying. It is important to maintain a low profile and not let the fish see you, if you’ve managed to locate a school, cast to its side, strip as soon as the fly hits the water. Methodically, cover the pool, tail in and tail out. A wide variety of nymphs and streamers work well. During afternoon, when the Mahseer are not chasing minnows, we often switch to tandem nymph rigs which induce fish to strike even at odd times. We use 12 to 15lb test tippet for Mahseer. Although active stripping of nymphs and streamers draws the most strikes, you can very well use a dry fly on a floating line during pre-monsoon low water conditions. Glacial rivers are fast and voluminous, fly fishing on these rivers demands blind distance casting to prospective pools and pocket water. It is a low numbers game but the Mahseer hooked are usually bigger and fight harder using the current to their advantage. Start out with a short cast and gradually increase distance with every cast. Target the pools and water around the rapids; it is good idea to use tandem streamers rigs to cover as much water as possible. Dead drifting and swinging streamer flies produces fish. Himalayan lakes hold trophy fish and are productive in both size and numbers. There is little angling or commercial fishing pressure so the Mahseer are thriving. Big fish from the lakes swim upstream to rivers pre or post monsoons to spawn, following which you can experience consistent river angling. 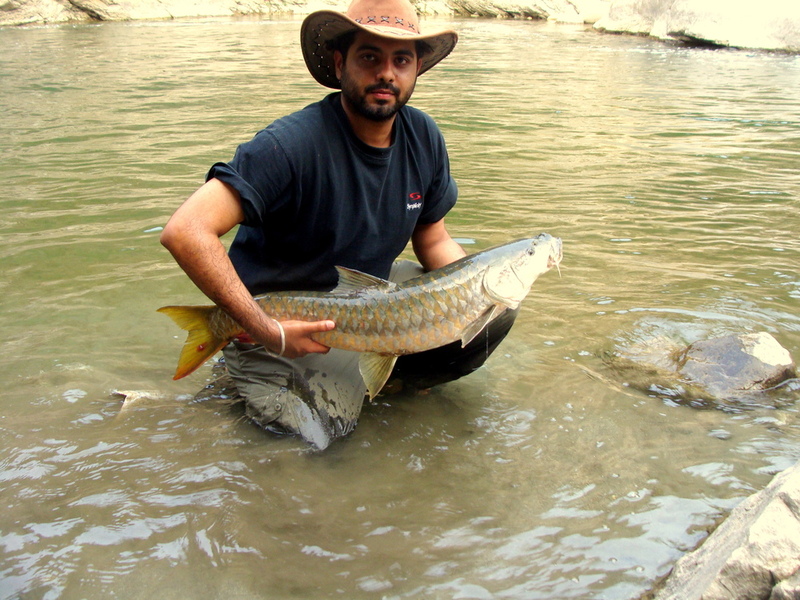 Best times to fish for Golden Mahseer are the post-spawning runs in April-May and October-November. The best fly rod to use for Mahseer is a 9 ft 7 wt single handed fly rod with an intermediate shooting head taper fly line. However, there are rivers and destinations where you can use a 6-7 wt double handed fly rod along with a Skagit line system. Himalayan Golden Mahseer is amongst the most challenging fish species to target with a fly rod. The take of a Mahseer is violent followed by a blistering run, if you manage to hook a decent Mahseer on any tackle; you’ll remember the experience for a lifetime. Anticipating smaller fish in the monsoon weather, I rigged up a Light action Trout Rod and Reel with 30 yards of 8 lb test line for Coarse fishing. This fish hammered the bait and took off on a near unstoppable first run, almost spooled the Trout reel but thankfully didn’t take me into the rapids. I had to palm the reel using my left hand to add more resistance. Run after run followed for a period of 20- 25 minutes. After some stellar netting by Sabir Manshahia, we finally managed to bag this 20 lb Himalayan Golden Mahseer. This fish left me trembling and enchanted by its power and beauty, a true Tiger of the Himalayan river systems. Moments like these remain etched in your mind for good and keep you motivated for years in Angling. Unfortunately, such events are getting rarer. These big fish are spawners and must be released back into the water. On that note, guys, have your fun but practice Catch & Release Angling. 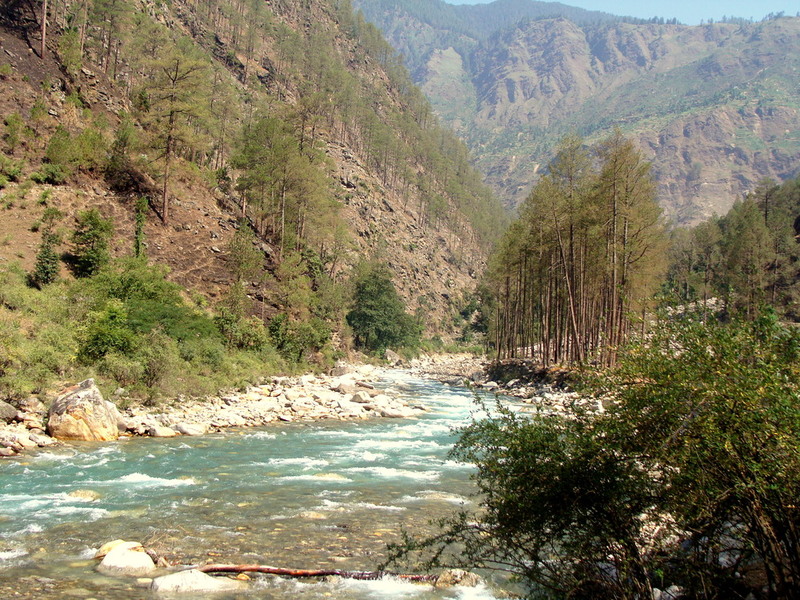 Himalayan streams and rivers in India offer opportunities to target wild Brown Trout. 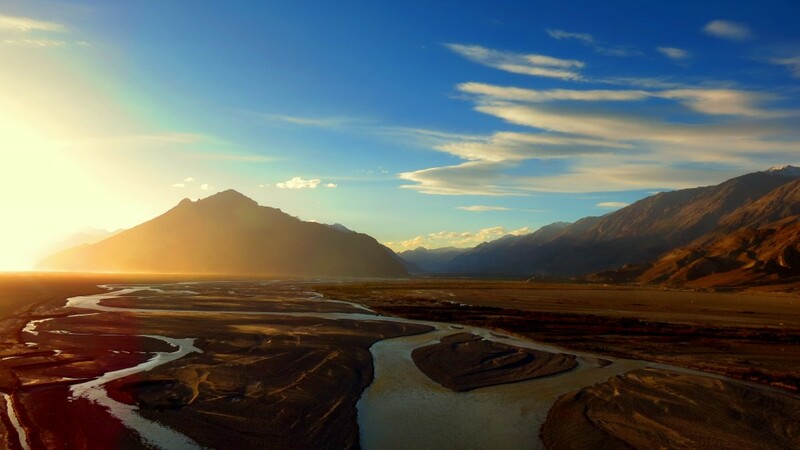 Besides angling, the valleys along the Himalayan mountain range offer opportunities for observing rustic culture, wildlife and nature hikes. From personal experience, our brown trout are best targeted with a 4wt 8’6 fly rod. Due to the high gradient of our trout rivers, we’ve had the most success using wet flies and streamers. Obviously, when the fish are rising or feeding just below the surface, we use dry flies and nymph setups (with indicators). We use 8lb test as tippet. During extreme summers, the snow melt kicks in, leading to high water levels so using a sink tip on our fly lines helps us present the fly to the fish’s level, besides making it easier to contend with surface currents. Presentation and casting at the appropriate spot, depth and mending the line is a challenge on Himalayan streams but if you consider all these aspects, Himalayan trout will definitely reward you with a strike. Himalayan Golden Mahseer found in the spring-fed and glacial rivers and lakes all along the Lower Himalayan range in India. Spring fed rivers run crystal clear for the most part of the year so you can spot a fish under many feet of water, which makes angling both challenging and gratifying. Glacial rivers demand blind casting in prospective pocket water (pools and tails) since these rivers are fast and voluminous, but the Mahseer fight hard using the current to their advantage. Himalayan lakes hold trophy fish and are productive in both size and numbers. There is little angling or commercial fishing pressure so the Mahseer are thriving. Big fish from the lakes swim upstream to rivers pre- or post monsoons to spawn, following which you can experience consistent angling. 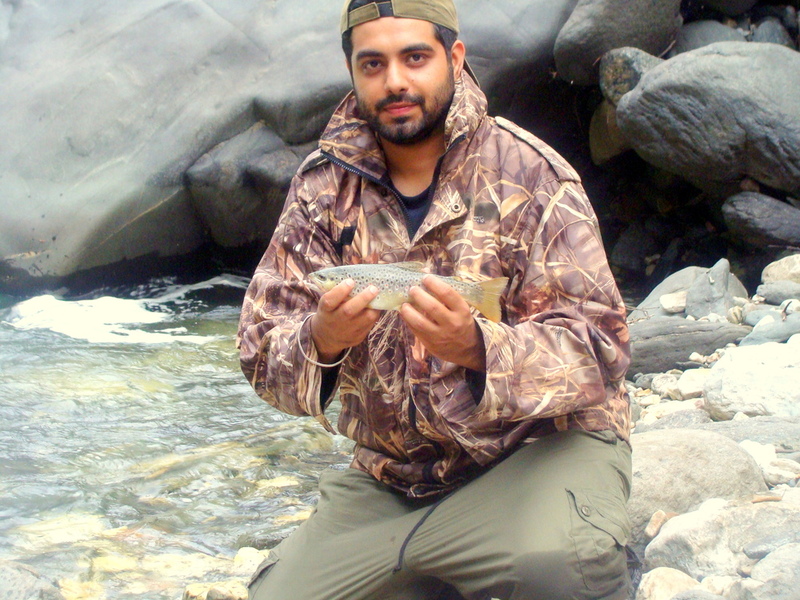 Mahseer fly fishing demands distance casting to prospective pools and pocket water. We recommend using a 7 wt 9’ single handed fly rod with an intermediate shooting head taper fly line. However, there are rivers and destinations where you can use a 6-7 wt double handed fly rod along with a Skagit line system. Mahseer’s diet includes algae, insects, crustaceans and other fish. A wide variety of nymphs and streamers work well. During afternoon, when the Mahseer are not chasing minnows, we often switch to tandem nymph rigs which triggers the fish to strike even at odd times. We use 12 to 15lb test tippet for Mahseer. Although active stripping of nymphs and streamers draws the most strikes, you can very well use a dry fly on a floating line during pre-monsoon low water conditions. Besides this, dead drifting and swinging flies produces fish. Golden Mahseer being a finicky fish, fly fishing definitely offers an advantage. Leader & Tippet : 8 to 9 feet of tapered leader of Sturdy Monofilament or Fluorocarbon material is recommended. The Tippet material is 12 lb test. We tie our own leaders, tapered from 20 lb (5 feet) to 15 lb (3 feet) down to 12 lb (1foot). Leader & Tippet : 7 to 8 feet of tapered leader of Sturdy Monofilament or Fluorocarbon material is recommended. The Tippet material is 8 lb test. We tie our own leaders, tapered from 12 lb (5 feet) to 10 lb (3 feet) down to 8 lb (1 foot). Golden Mahseer swims away after being released! India is a land of diverse landscapes, people, languages and religions. All these aspects of the country can be observed very minutely on Road Journeys. Well laid out road networks from the Himalayas in the North to the Southernmost tip of the country establishes roads as the most ideal mode of travel in India, especially, if you intend to visit the remote, less travelled Himalayan hinterland and interior India. Himalayan Outfitter has created special Itineraries for both Outdoors and Leisure Travellers to showcase the cultural and natural beauty of Himalayas and India. The best part about our Jeep Safaris is that these tours can be modified to suit your interests and we work with you to include all possible activities or even alter the time spent in a location to ensure that your Journey with us is a memorable one. India is a land of diverse ecosystems where thousands of varied flora and fauna co-exist just like its diverse culture, heritage, languages and what not. 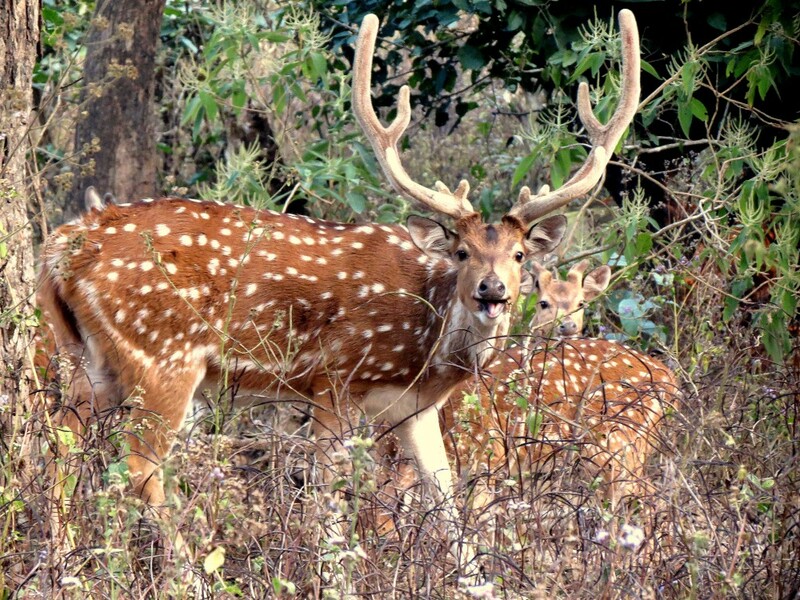 Wildlife Safaris in India are anything but tame. Elephants, reptiles, bears, wolves, wild boars and wild dogs roam the lush forests, while snow leopards make lonely footprints in the Himalayan snow. Other well-known large Indian mammals include ungulates such as the rare Wild Asian Water buffalo, Nilgai, Gaur and several species of deer and antelope like Sambar, Muntjac, Cheetal. Of course, the holy grail of any safari is seeing the big cats: Wild tiger, Asiatic Lion and Leopard. Himalayan Outfitter has identified the richest natural history destinations and carefully developed itineraries that maximize wildlife and cultural experiences for you, both in the Himalayan region and some other areas in India. Vast and contrasting landscapes of the national parks in India: western India’s deserts in Gujarat to dense forests of Himalayan foothills offer a plethora of options to the Wildlife enthusiast to observe the Indian Jungle and see India from a different perspective. 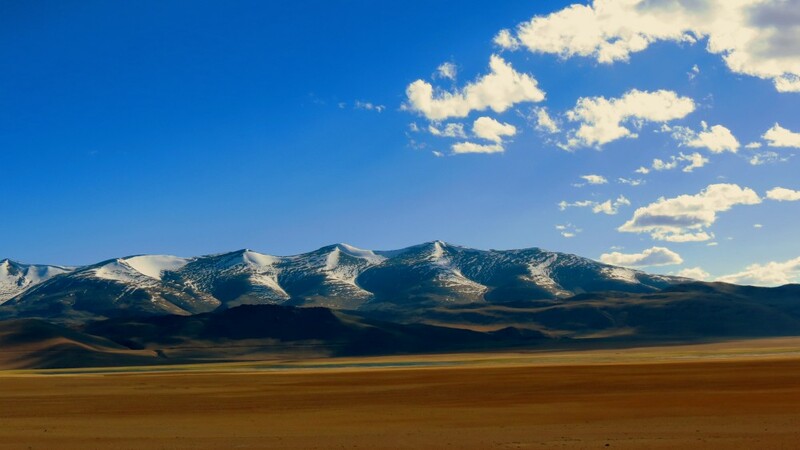 The Himalayas, is a mountain range in Asia separating the plains of the Indian subcontinent from the Tibetan Plateau. The Himalayas is the highest mountain range of the world with over a hundred mountains exceeding 7,200 metres (23,600 Ft.) in height. Giving Birth to many life giving rivers, religions and cultures of the world. 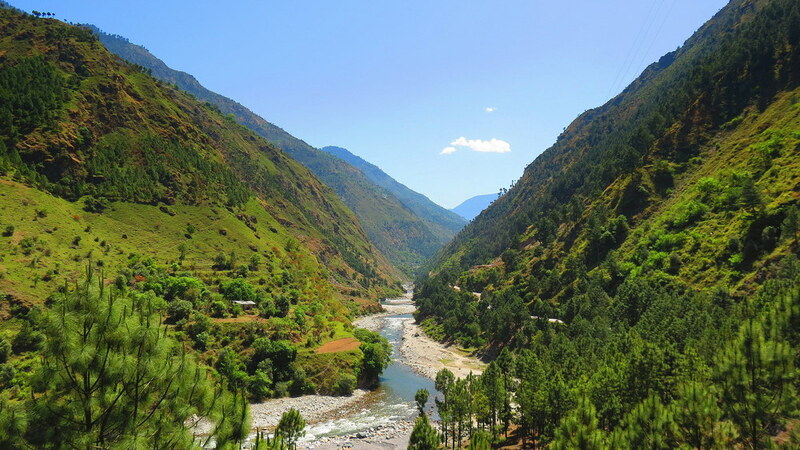 Indian Himalayas offer a wide range of trek routes for people of different fitness levels, tastes and expectations, therefore, being a magnet for both Outdoors enthusiast and Leisure traveller alike. We at, Himalayan Outfitter, work with local experts all across Indian Himalayas creating itineraries for remote, less travelled regions, offering a diverse range of walks ranging from Soft to Moderate treks catering to both Outdoors enthusiasts and Leisure Travellers interested in photography, local culture, wildlife and solitude. While on tour, we try to provide the best available in terms of food, amenities and service to all our guests so that your Walking tour to the Himalayas is a safe and memorable experience. 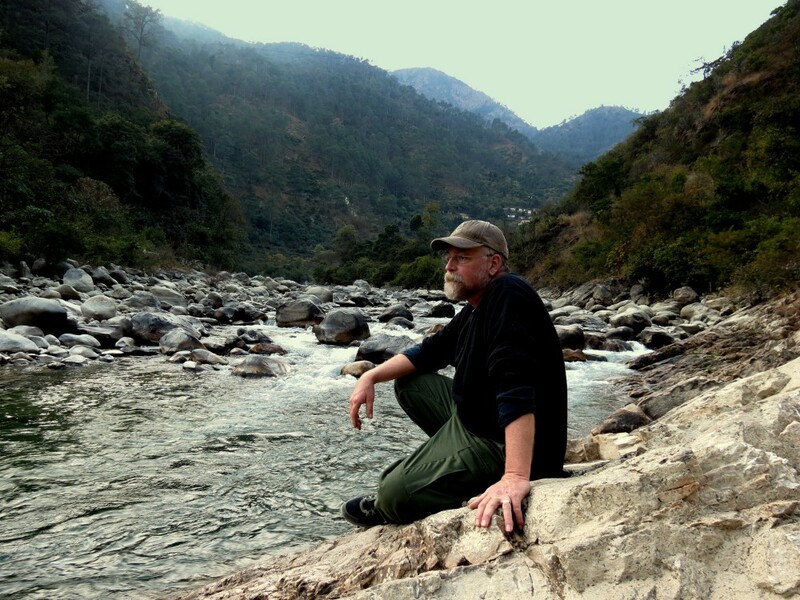 Walking in Himalayas means one must be free from any kind of illnesses. If you at any point before embarking on a trek either mentally or physically, feel uneasy or an onset of any minor illness it is better to delay the trip as medical facilities may not be available in the remote interior areas. Elementary medicines may be available in far off places but one should be self sufficient as far the medicines are concerned. A certain degree of physical fitness in which muscles are conditioned to take the rigors of ascent and descent in long marches. A trek is enjoyed more if you are not particularly tired on reaching the camp after a day's trek. Doing some cardio-vascular exercises and aerobic activities will help you prepare for the trip. Day 1: Pick up from the New Delhi International airport and drive to Corbett Tiger Reserve which takes 5 to 7 hours depending on road traffic. Meet the staff and get briefed about the area and the river. Unwind and prepare for next day's fishing. 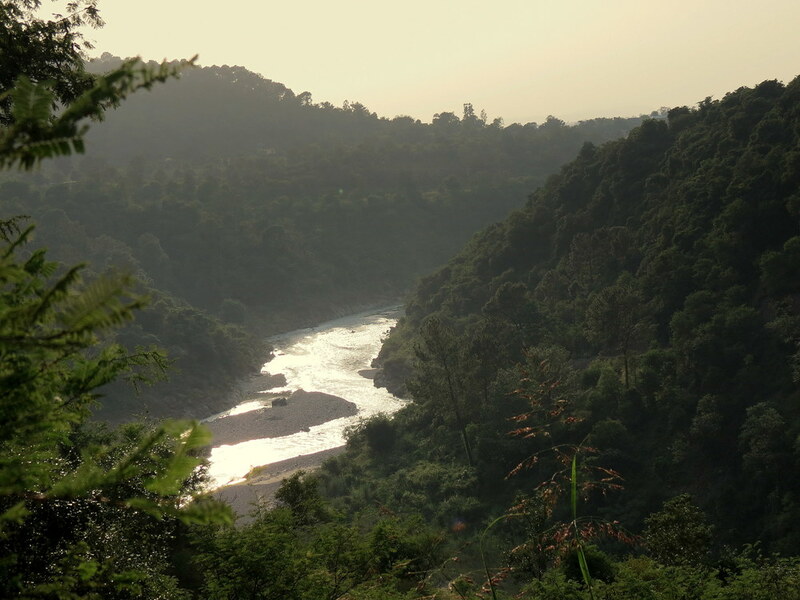 Day 2 and 3: Cover two different beats of the Ramganga River with opportunities to observe local village culture. Day 4: A full day excursion of the Corbett Tiger Reserve for Game Viewing and Bird Watching. 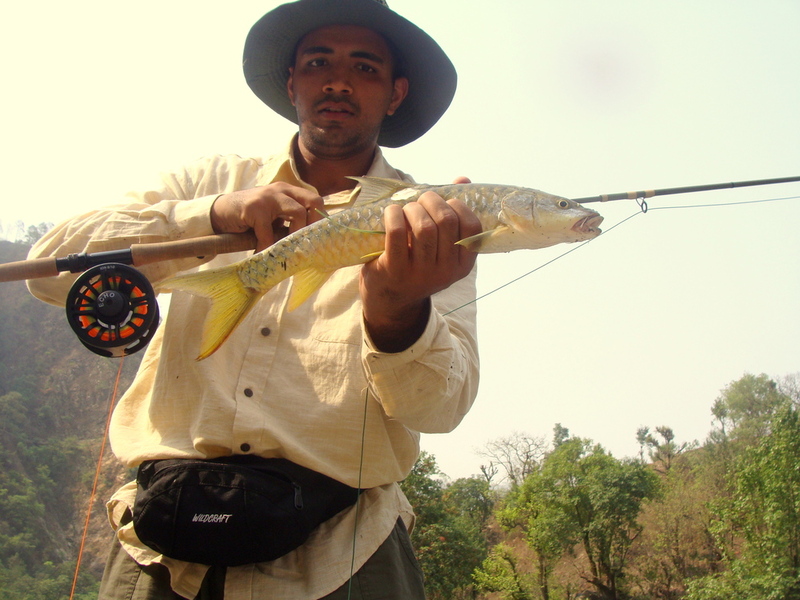 Day 5 and 6: Explore a different jungle angling beat each day and get well acquainted with Mahseer waters and tactics. Day 7: Departure from the camp, accompanied back to the New Delhi International airport. Accomodation , Transport, Meals and Snacks, Beverages and Mineral Water, Fishing Permits and Guided Fishing, Nature Hikes and full day Game Safari. Airfare, Alcoholic Beverages, Fishing Equipment, Tips and Incidentals. Mid- February, March, April, May, October and November. Several years ago, Chris Santella contributed Fifty Places to Fly Fish Before You Die to the “Fifty Places” series of books that cover a range of passions from golf to, of course, fly fishing. Perhaps moved further by his passion for fly fishing, Santella also wrote Fifty More Places to Fly Fish Before You Die. Detailing the more world’s most alluring fly fishing opportunities, Santella describes adventures from mako shark fishing in San Diego to Giant Mahseer in Himalayan India. Fifty More Places to Fly Fish Before You Die is an excellent book for the traveling angler and can be found in many fly and book shops.